These latest Building Community awards bring GW4’s investment in collaborative research communities to over £2.8m. The GW4 Alliance is pleased to announce funding for 12 new collaborative research communities tackling a range of global and industrial challenges. The successful communities include a research group which will explore the responses and preparations of our region’s businesses for Brexit and UK trade policy; and another which combines GW4’s interdisciplinary expertise to create the world’s first research network on suicide, homicide, and self-harm in parent carers. Professor Kim Graham, Chair of GW4 Board and Pro Vice-Chancellor for Research, Innovation and Enterprise at Cardiff University said: “It was a privilege to read so many high calibre applications bringing together researchers across the four GW4 Institutions, demonstrating the potential for the region in delivering world-leading research at scale. “I was also delighted to see a strong level of interest from our early career researchers, including a research community looking at physical activity during pregnancy and another aiming to improve classification and diagnosis of epilepsy. GW4 supports early career researchers in many ways, including via the Building Communities scheme and initiatives such as the GW4 Crucible. The projects were kick started and shown “some love” at the launch event today, Thursday 14th February, at the Watershed in Bristol. This year’s event showcased the wide range of resources and information available from GW4 including communications support, funding advice and opportunities. Fellow award holder Professor Isabelle Durance, Director of the Water Research Institute at Cardiff University, shared her experiences of successfully creating and scaling from Building Communities funding to developing the GW4 Water Security Alliance, one of the largest collaborative water security research endeavours in Europe. The research communities also learnt several tools and techniques to help ensure a successful partnership. 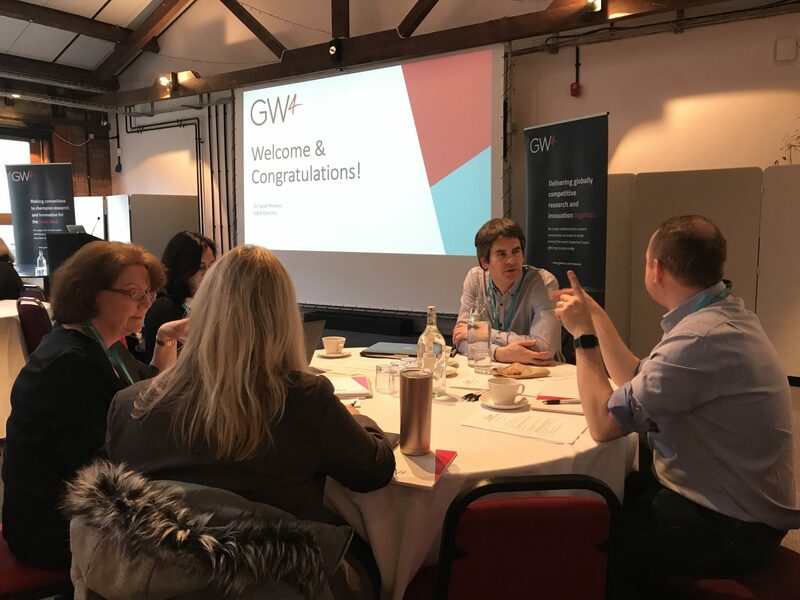 Nine of the twelve communities received GW4 Initiator funding, which offers awards aimed at emerging GW4 research networks, to establish themselves through collaborative activities such as sandpits and workshops. The remaining three were awarded Accelerator funding, in order to scale up these existing communities to deliver a step change in world-class research and achieve large scale bids. Over the past five years GW4’s research communities have encompassed a variety of research areas and disciplines. These communities have stimulated partnerships with over 200 external partners, such as the Met Office, Rolls Royce, NHS, Natural History Museum, Veolia and the BBC. Take a look at our research community case studies. These distinctive GW4 communities, delivering outputs and outcomes not possible as a single institution, have influenced national policy, developed world-class facilities, and provided the foundations for major research programmes tackling global challenges. The research groups are collaborative communities across the four GW4 universities, Bath, Bristol, Cardiff and Exeter; which are four of the most research-intensive and innovative in the UK.